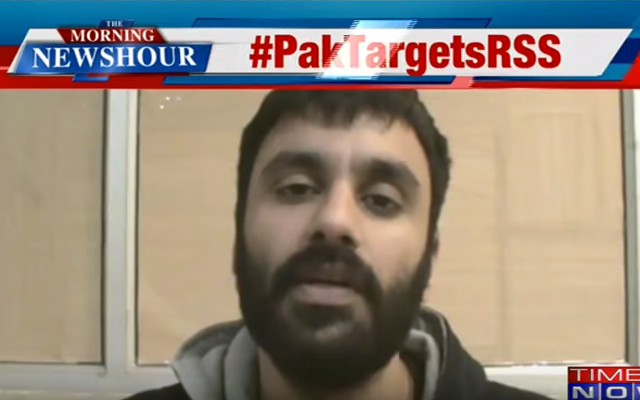 A video has surfaced on the internet recently titled “Shocking Terrorist Video: Sensational Confessions On Tape By Jagtar Singh Johal, Terror Accused” uploaded by Indian TV channel “Times Now”. The video starts with Johal describing how he got interested in learning about “1984” (referring to Operation Bluestar) by listening to speeches of Sant Jarnail Singh Bhindranwale and dhadi jathas online. He further became involved with NeverForget84.com by translating articles from Punjabi to English from magazines such as Sikh Shahadat, Vangar, and Fatehnama. Through friends and relatives of the webmaster of NeverForget84.com he was contacted by a Harmeet Singh PhD from Nankana Sahib. He proceeded to share his MSN Messenger ID with Johal and they began chatting. The video then abruptly ends when Johal explains that Harmeet Singh PhD told him that the Sikh leadership in Pakistan does not get along with each other. No confession was made during the entirety of the video clip nor are any of the statements made by Johal indicative of criminal behavior. Hypothetically speaking, if there were some incriminating statements made they would not have held any evidentiary value in court. As per the Indian Evidence Act sections 25 and 26 any statements made during police custody cannot be held against a defendant. The titling of the video as a terrorists confession is misleading and irresponsible on Times Nows part. The availability of the video clip also raises the question: who is responsible for releasing it to the Indian media and with what intention. While it is not uncommon for agencies to make audio and video recording during investigations, such evidence is meant to be strictly confidential. Johal is currently in the custody of the National Intelligence Agency (NIA), who in the first place cannot examine Johal until having gone through the legal process of requesting remand from the special court. The NIA is potentially responsible for releasing the video and in doing so most likely against internal protocol. The #FreeJaggiNow campaign has gained much momentum and as a result the attention of global media and human rights organizations. This could be an effort by the NIA to curb this momentum by means of character assassination.